It’s been quiet on this website but that doesn’t mean I’ve not been working away. 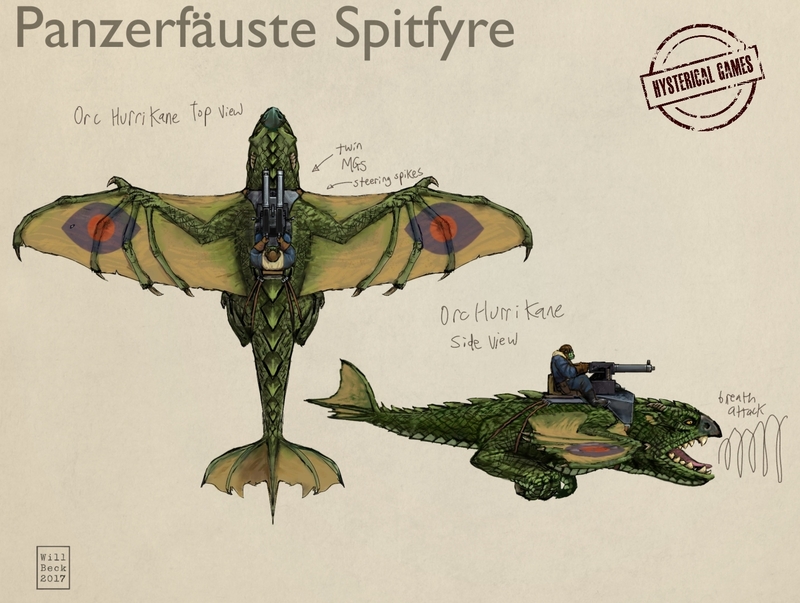 Here are some images I created for Hysterical Games’ Panzerfäuste Spitfyre game. 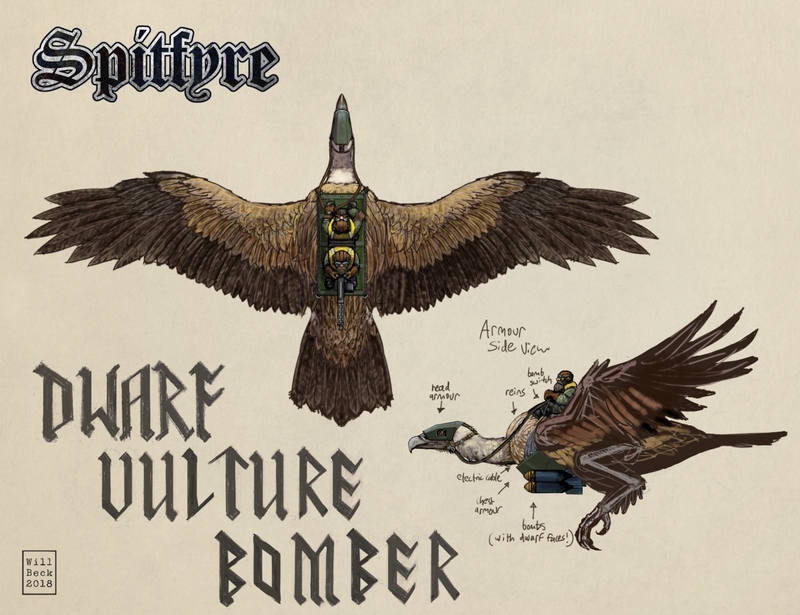 This is a wargame of aerial combat in their ‘historo-fantasy’ world. 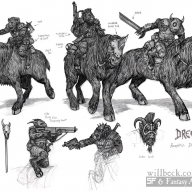 As a 10mm wargame the miniatures would need to be easily identifiable from the basic shape and size. 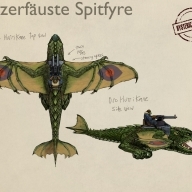 So I found some WWII spotterguides online and enlarged the silhouettes of the Spitfire and Messerschmitt 109 aircraft so that they were all the same scale to work on. 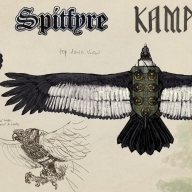 Then I scaled a plan view of the planes to each and proceeded to digitally paint (on a layer above) the creatures in top down view, keeping the pilots and machine guns on separate layers. 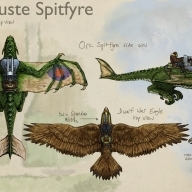 I used these as guides only, for the fantastical creatures like the Orc wyverns I could tweak the wing shapes quite closely to the aircraft but for the giant creatures I’d need to keep the proportions similar to their real-world counterparts. 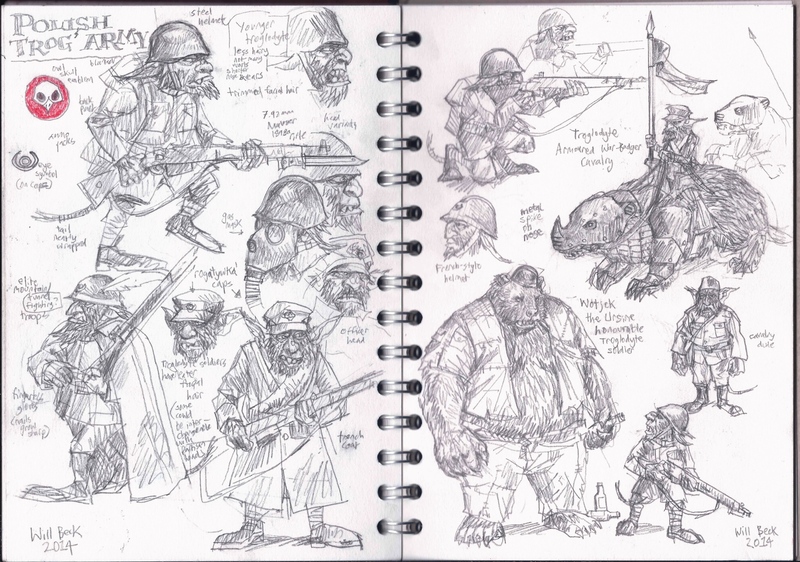 A couple more Panzerfäuste sketchbook pages. 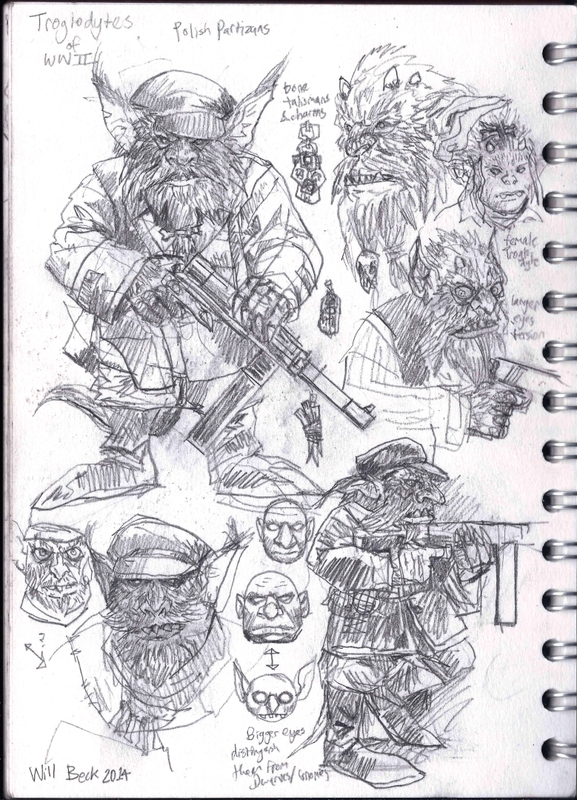 Here are my initial sketches for Hauptmann Entwickler; an eccentric Dwarf inventor veteran. 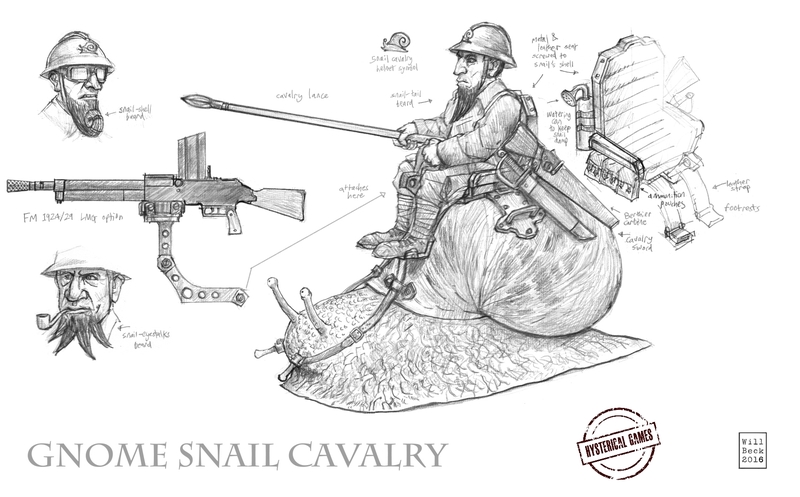 He wears a WW1-style German helmet with a perch for his Nachtsichtfrosch (a simple lick will temporarily give him enhanced night vision!). I gave him little automaton robot mines which would march towards the enemy. 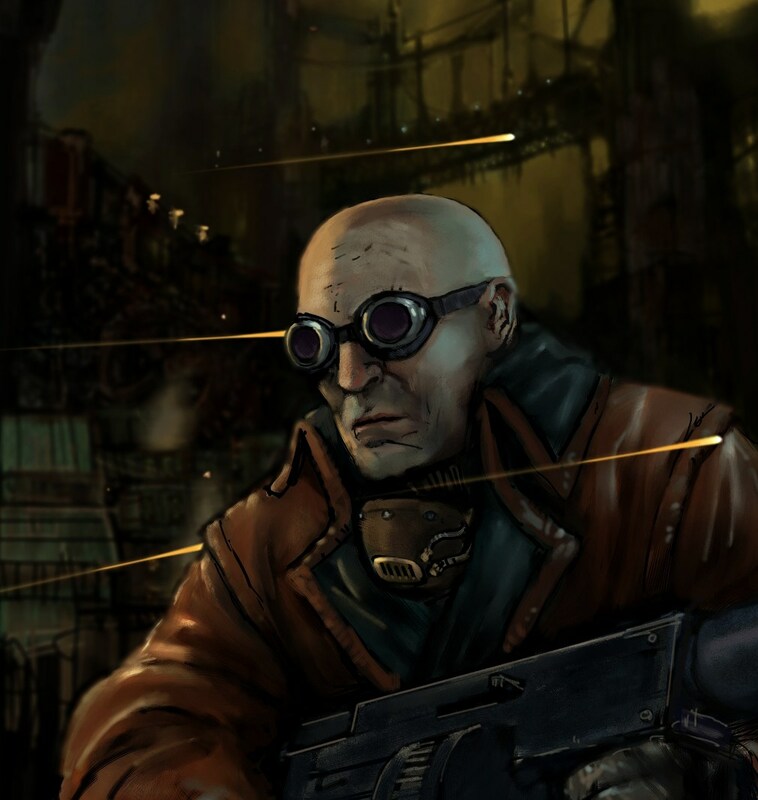 And here he is sculpted by the talented Irek Zieliński. 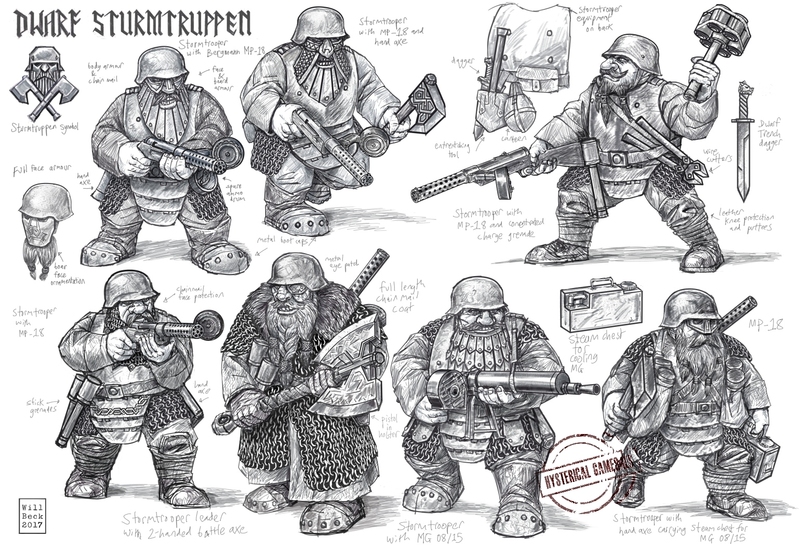 And here are some early concepts for the Gnome Infantry and their Alpine troops. I was trying various beard shapes and some subtle more French moustaches rather than Germanic ones. 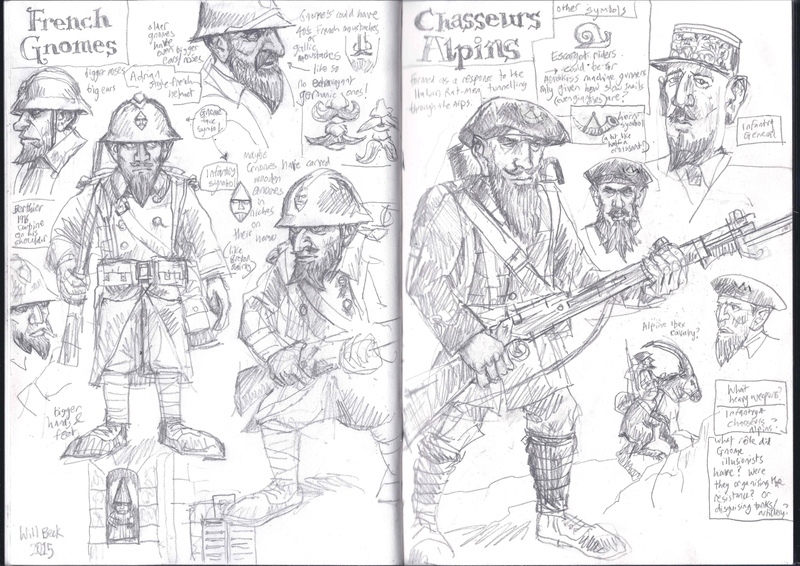 Traditionally Gnomes in Panzerfäuste don’t sport moustaches but I imagined some younger Gnomes might have typically French moustaches! As it’s well past Hallowe’en (and not yet Christmas) I thought I should update my website! 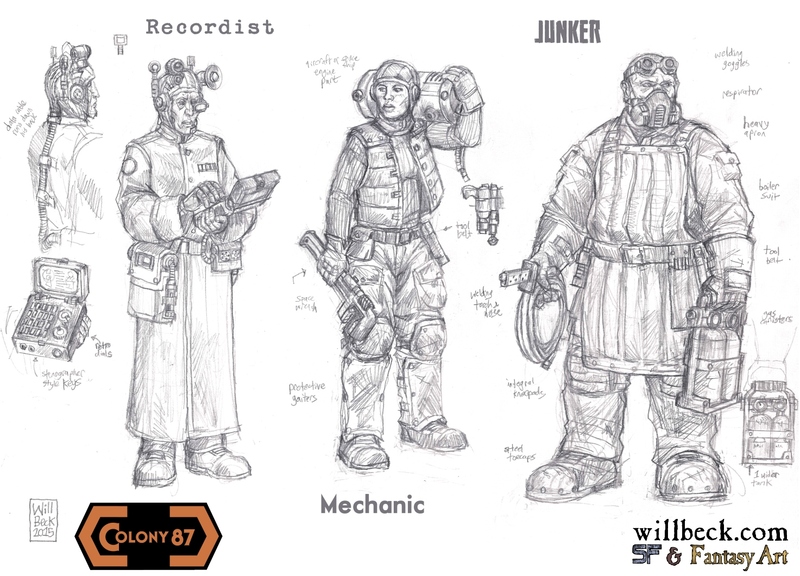 So for the next few days I’ll upload some relatively unseen concept sketches. 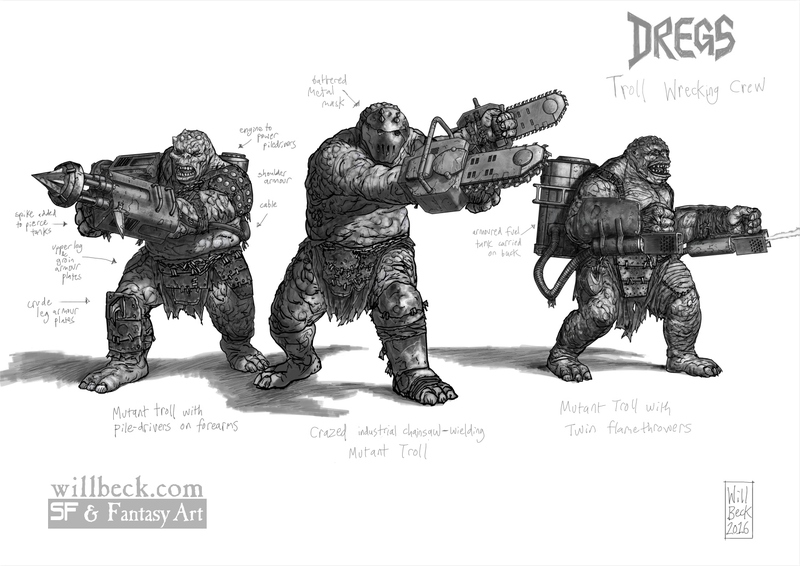 These first were done when I had just started working for Hysterical Games in 2014. 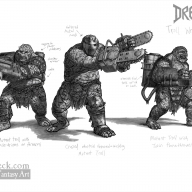 They’re my early ideas for the Troglodytes, a fantasy race unique as far as I can tell to the Panzerfäuste world. 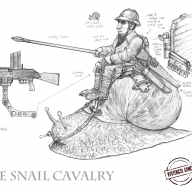 Eventually they evolved into a full miniature range which will be arriving in 2017. 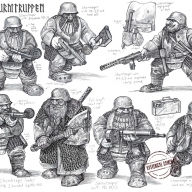 In ‘The Land’ (the world of Panzerfäuste) they occupy the area equivalent to Poland in our world (between the lands of the belligerent Dwarves and Dark Elves) so their equipment is based on the Polish gear and weapons of the WW2 era. 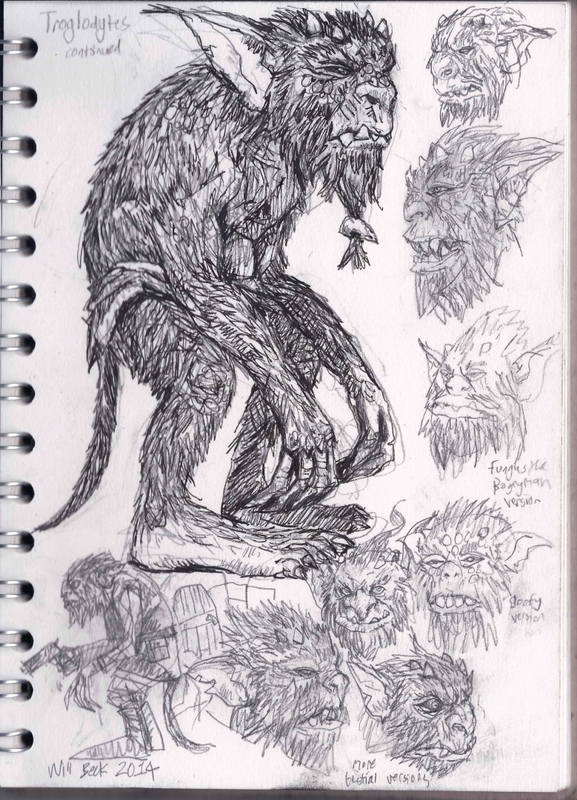 They are described as underground dwelling (hence the name), mainly covered in fur, hunched but not simian, with tails and short horns. 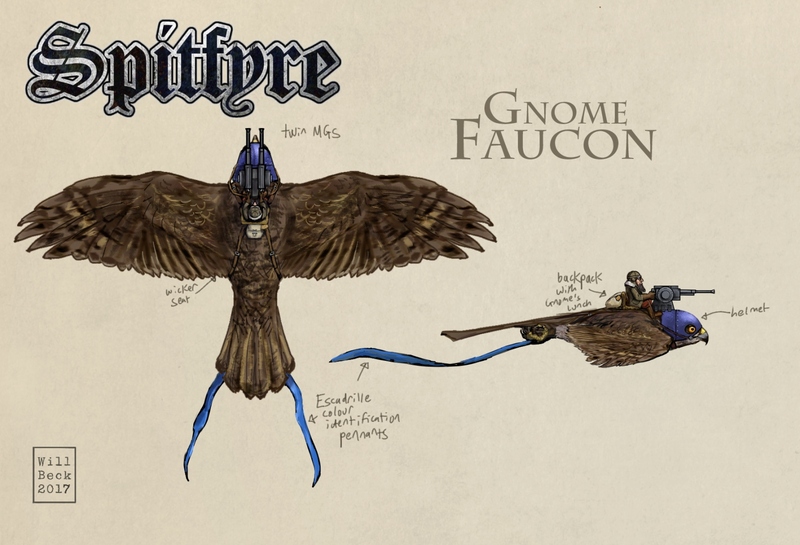 They’re fairly grotesque really so I tried to imbue much of that but at the same time give them some nobility! 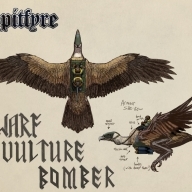 They have a shamanic culture so I added little bone fetishes and jewelry to some of them. 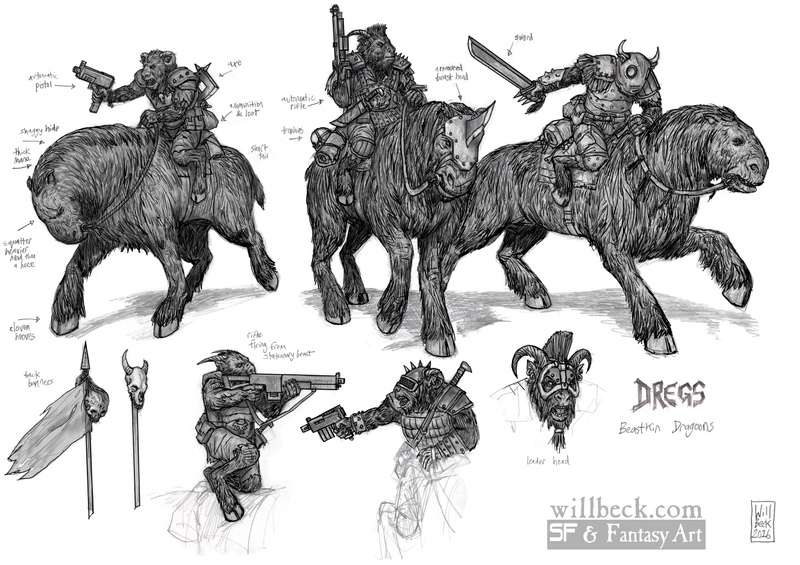 And for the third sketchbook spread we have some early ideas for the Troglogyte footsoldiers, an unused War-Badger mount for the cavalry and the Troglodyte Brute – Wojtek the Bear. A belated Happy New Year! 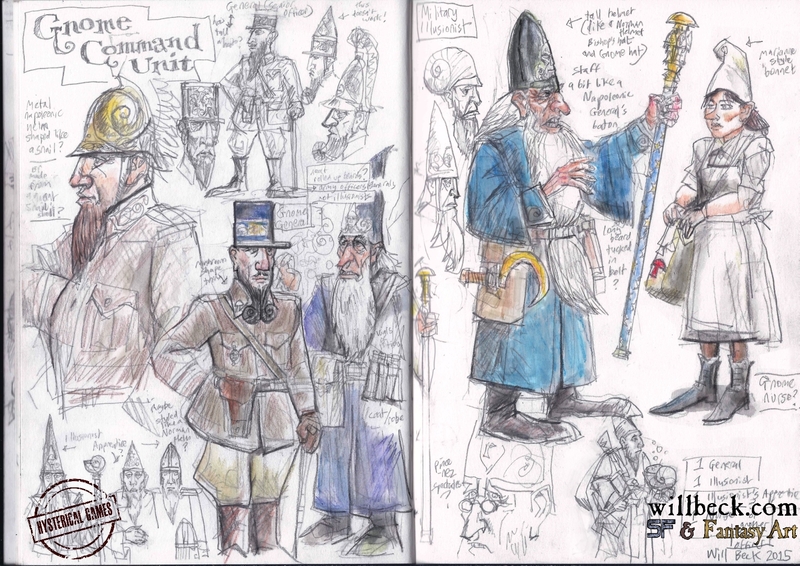 My first post of 2016 is of some of the sketchbook pages I drew for Hysterical Games’ Panzerfäuste miniatures wargame. 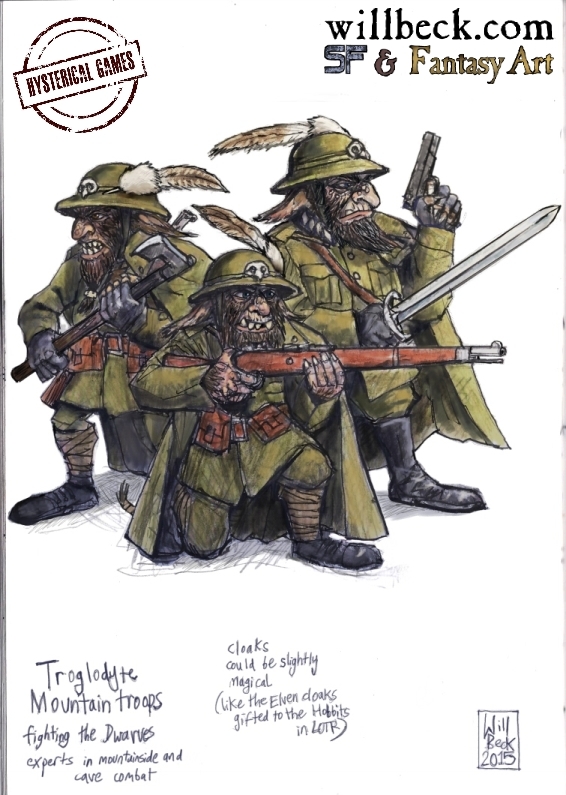 The first is some Troglodyte mountain troops, these are (in Panzerfäuste) the Polish so have the equipment and weapons appropriate to the real world equivalent. 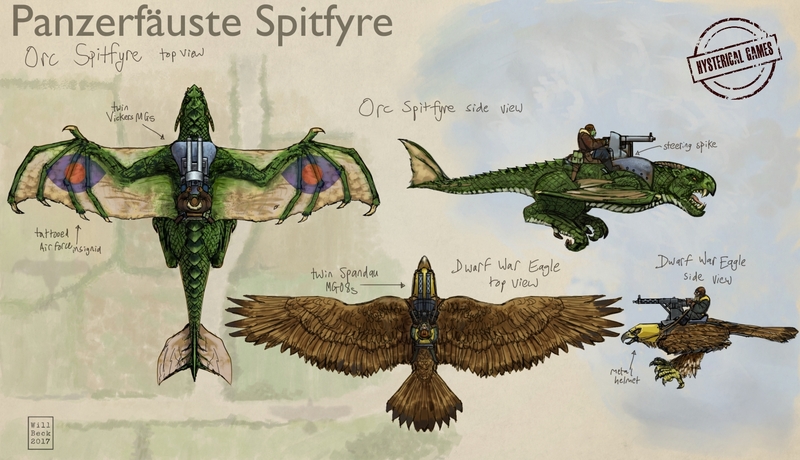 I drew these for their Kickstarter page as I had only provided them with a rough sketch originally. 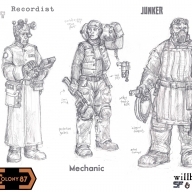 Here are some Gnome commanders, wizards and generals and a nurse to heal the troops. 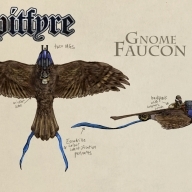 Gnomes, in Panzerfäuste are French so I thought the druid (Getafix) in Goscinny and Uderzo’s Astérix The Gaul would be an appropriate character to homage for the illusionist. 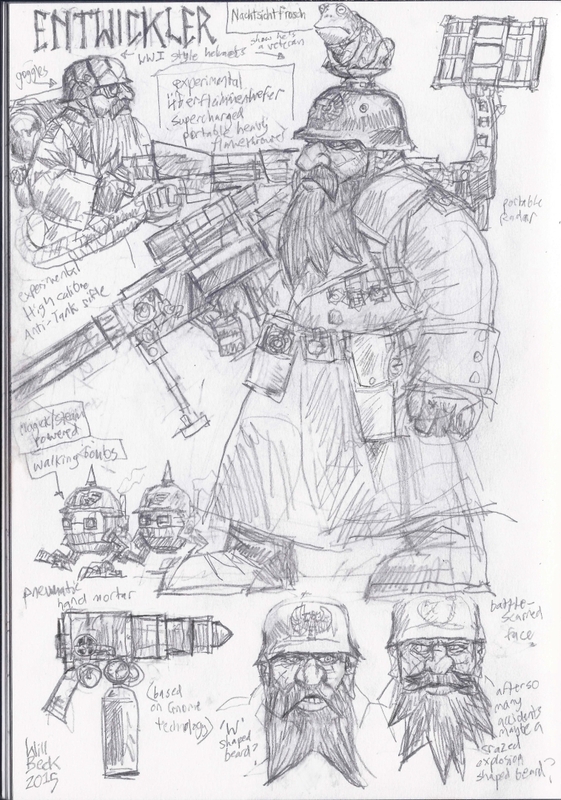 This is an idea from John Bell that the Hysterical Games team wanted a bit more work on; the Dwarf Panzerbär. I based the shapes of the armour on the German Sd.Kfz Armoured Cars from WW2. 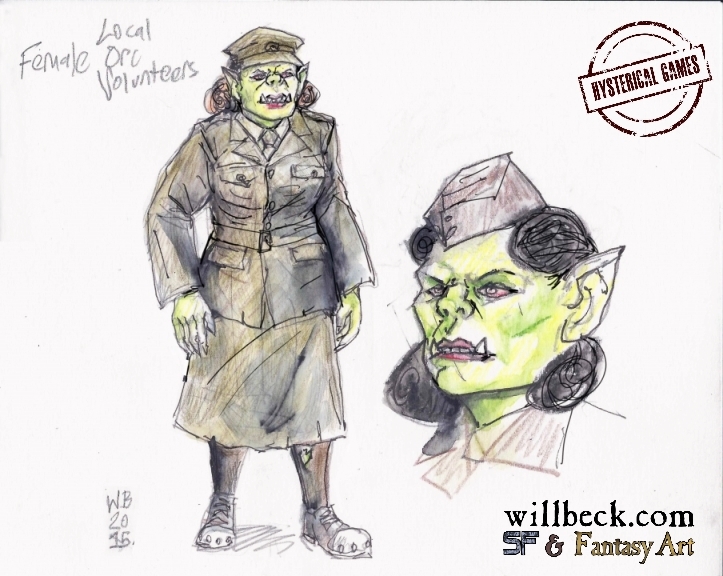 And finally an extra Orc for the Local Orc Volunteers (Orc Home Guard), though I’m not sure if this will be produced as a miniature. 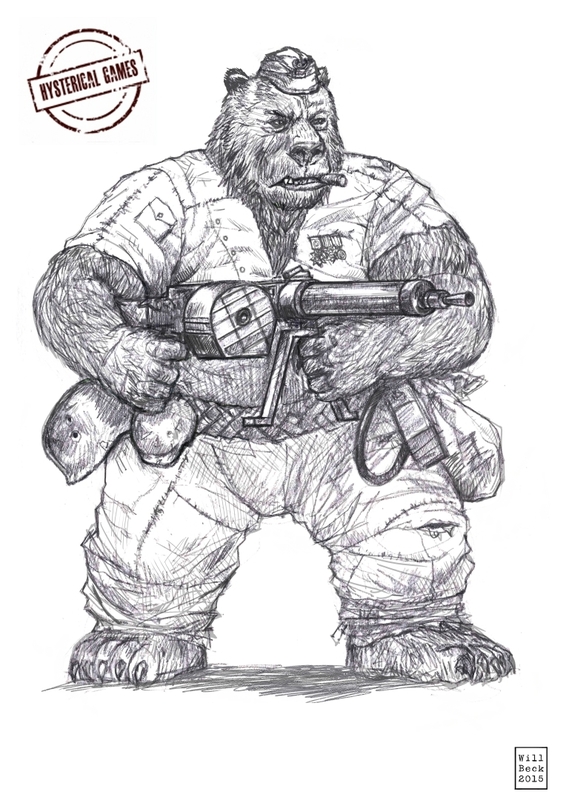 As part of this ongoing commission I created Wojtek the Bear, a character I based on the actual bear named Wojtek by Polish troops who adopted him in World War 2 Wikipedia entry for Wojtek (bear), carrying a MG08-15 machine gun. 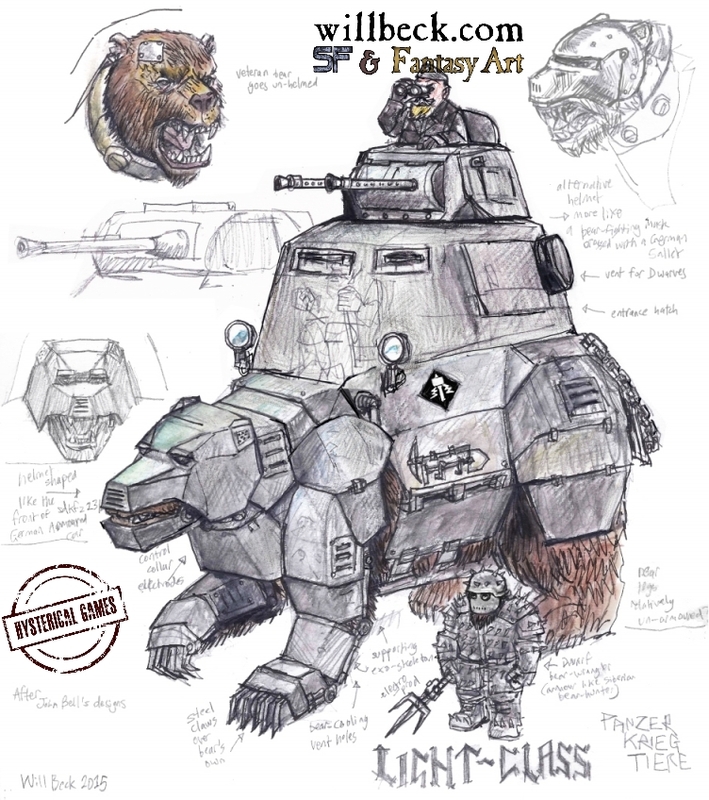 Wojtek is a helpful bear used by the Troglodytes in the Panzerfäuste world to carry things and to fight the Dwarves.